Lost and Found Kissing Snails! 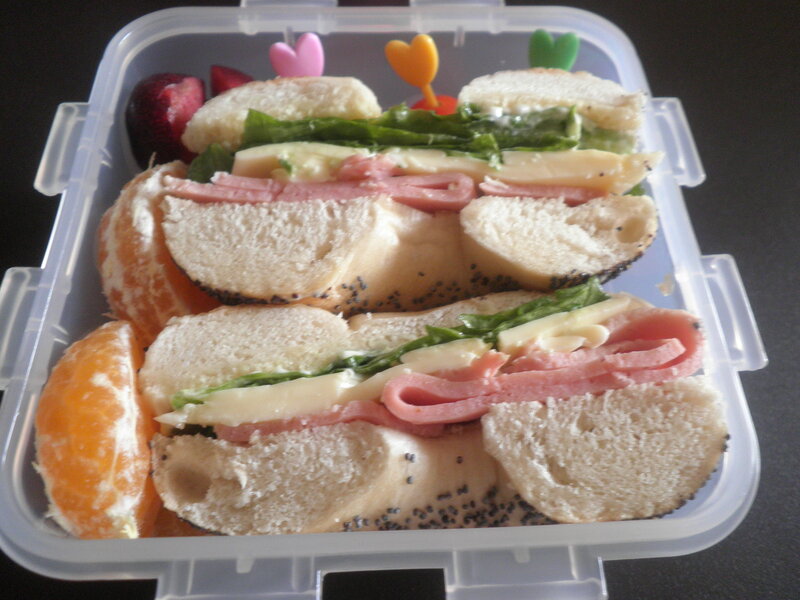 This bento was made some time ago and was really upset when I could not locate the picture but voila! Found it accidentally, all this time saved in my netbook. Looked high and low for it and when not looking, it appeared! 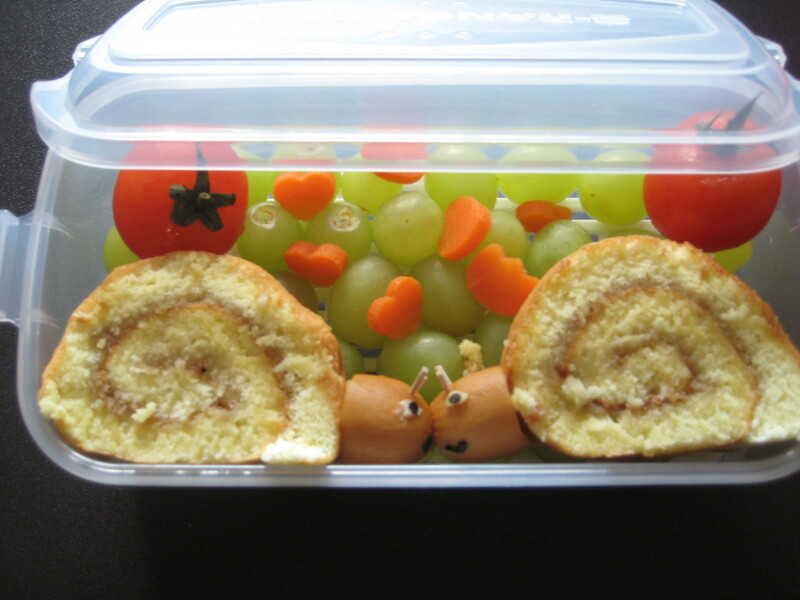 Here it is the lost and found kissing snails bento! Made the above snails from kaya swiss rolls bought from Yut Kee, a coffee shop established since 1982! (a blog about it is found here, http://www.placesandfoods.com/2010/01/yutkee.html) Those rolls are really delicious especially so that I love kaya (a spread made from egg and coconut milk). One is never enough so I had two! Haha! The snails’ head were made from sausages, details from cheese, nori and dry soba. In the box there were grapes and cherry tomatoes. Had the snails kissing so I added some heart shaped carrots. 😀 Now that I am looking at this bento, I realized this must have been made really a long time ago coz I didn’t have any picks in the box! But am so glad that I found this to be posted again! In each boxes there were mini cheddar cheese sandwiches. Eva’s sandies were cut into shapes and stamped with hello kitty images while Keith’s are cut into vehicles shape and stamped with the details. 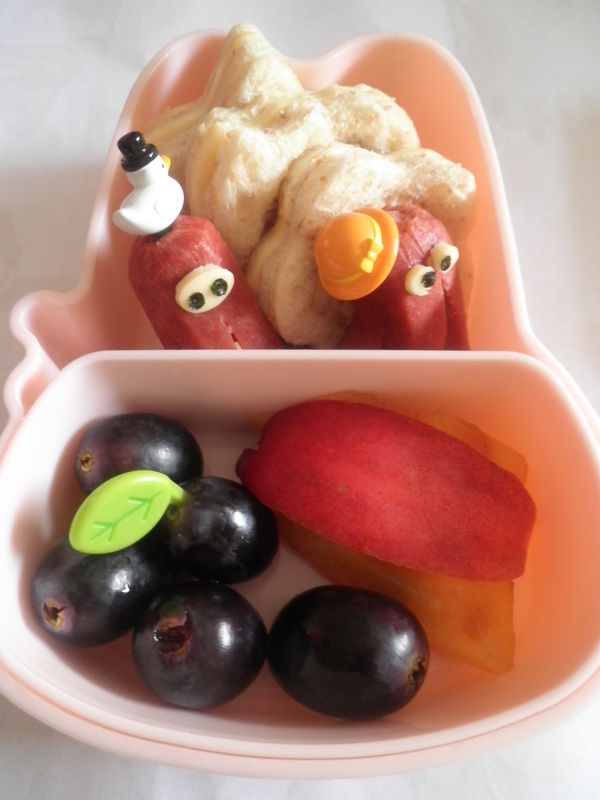 Each also had two octopus sausages, grapes, nectarine and plum. Eva’s had a fall at the park and her cries could be heard all over the park. She’s been walking with a limp and is made worse with a bad cold and fever now. She’s really under the weather but when I asked if she wants to go to the park she said “YES”! 😀 They enjoyed the monkeys, fishes and tortoises at the park more than the “BIG” birds! haha! Just got back from a really short trip to Jakarta, Indonesia and hence am really tired. Overslept this morning but still managed to made a little bento for myself and that’s thanks to the planning the night before. 😀 The two days that I were away, I felt so lost coz I could not catch up on the bento tweets as there was no WiFi connection at the hotel. Only managed to log on during a short trip to the MOS Burger outlet and during my waiting time at the airport. Am glad to be back! The box contains fried radish cake from the night market yesterday after arriving home. This dish is made up by frying cube radish cake with beansprout, spring onions and some pickled vegetables as well as sambal belacan. Its really yummy and it is one of the stall at the night market that’ constantly has got a queue. In the same radish cake box there’s also home made egg and fish past roll. This is made by my aunt and all she does to make this dish is fry an omellete and then spread some fish paste on the it, roll them up and steam it. The fish paste is also home made. Very very yummy too! I used some lettuce leaves as the baran to separate the radish cake from the egg fish roll. In the bottom tier of this Pooh Pooh box is the fruit layer. Had some cherry tomatoes, grapes, pineapple and guava. Could not help it but overdose the ducky picks coz the box looks kinda plain. Haha!! One of the coolest thing among all the cool thing about bento making is the giveaways that the bento community seems to be really generous about. 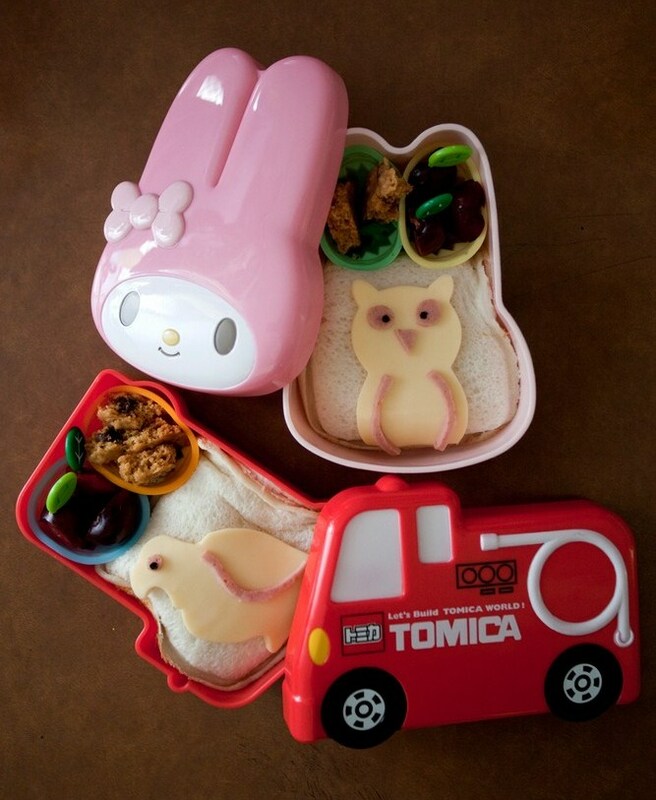 And since am also a bento-ist, I would like to join in the gift giving spirit! Guess the gift? Yup, its about bento and am giving away one of the coolest bento book of the year, Yum Yum Bento Box – Fresh Recipes for Adorable Lunches by Crystal “Pikko” Watanabe and Maki Ogawa (http://www.yumyumbento.com/)! 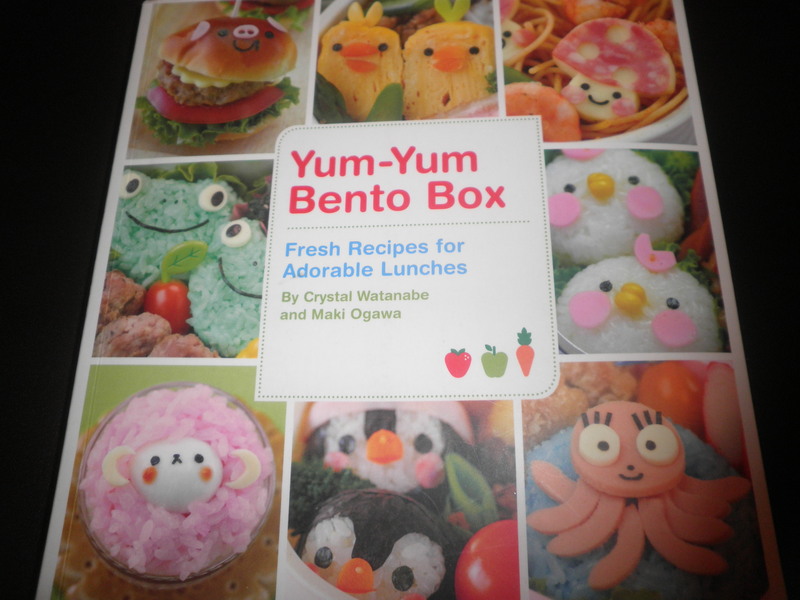 This is the very first bento book that I’ve purchased and love the graphics and ideas by Pikko. My daughter loves it too and it sort of became one of her bedtime “story book”. She loves the pink sheep one a lot and she wants me read to her almost every night and we’ll sing “baa baa pink sheep have you any wool…la la la”.This book is really great to get some inspiration when you have “bento” block which happens once in awhile. I will be traveling quite a bit in the next two to three weeks so I will want to conclude the draw before I go MIA. Hence, the last day for submission is 31st August 2010. Please kindly provide to me your email address too so that I could contact you if you are the lucky one! Let’s get the ball rolling! Last Sunday, I brought my daughter and nephew to the Bird Park. It seems that the Kuala Lumpur Bird Park has the largest South East Asia “Free-flight Walk-in Aviary”. And because of the free-flight, both the kiddos were afraid to walk on their own and we had to carry them most of the way. But managed to convince them to walk when the birdies were not on the pathway at some time. 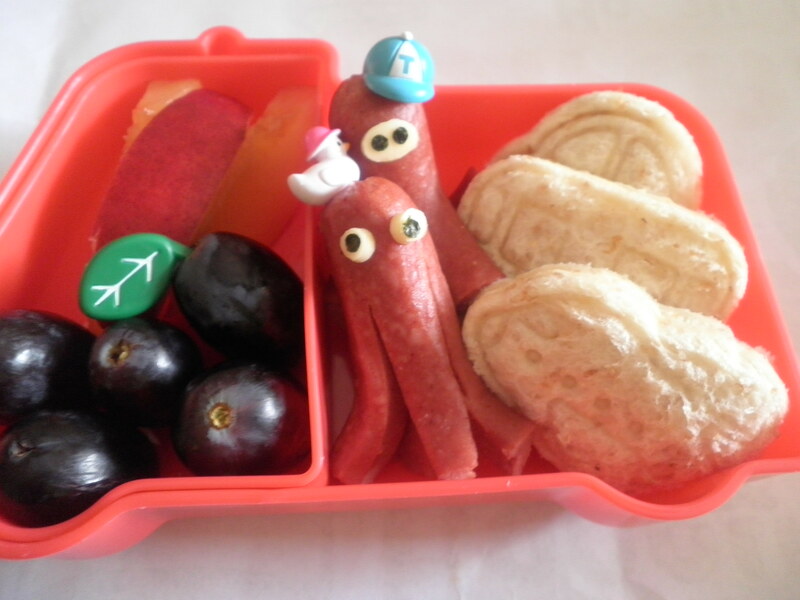 Anyway, of course this post will have bento coz that’s what my blog is all about. Hehe! 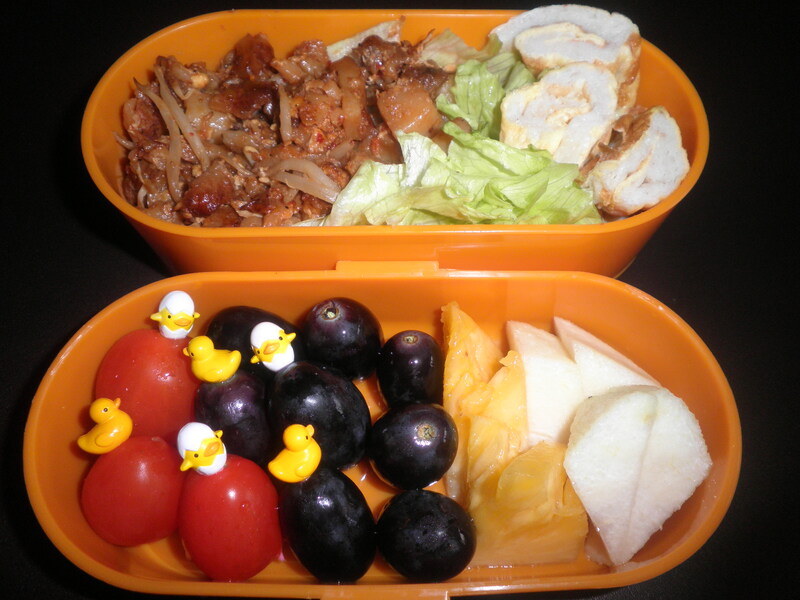 Since we were going to the bird park, I made two birdy bentos for them. Made them each a luncheon ham sandwich, some home baked oatmeal chocolate chip cookies and little cherries. Decorated the sandies with an owl (for little girl) and an eagle (for little boy) made from cheese cut out with luncheon ham features. Here they are! 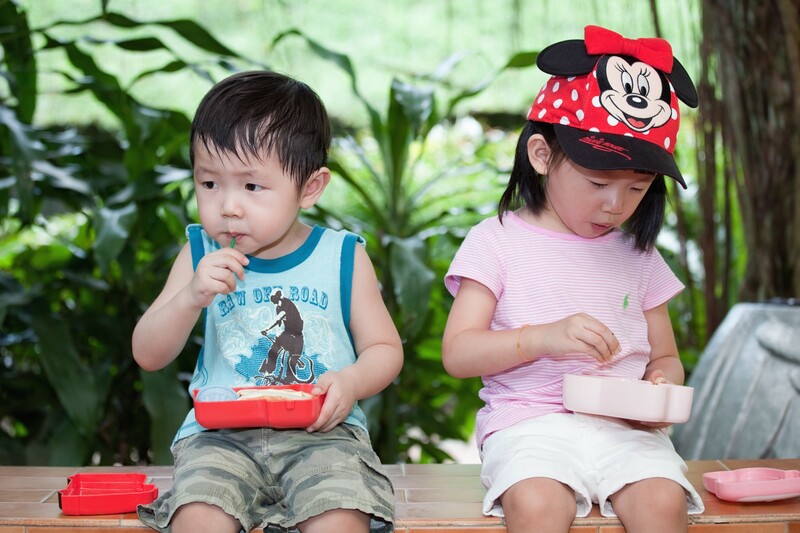 And here’s a picture of the kiddos enjoying their bentos. I asked them later if they would like to go to the bird park again, they both said in unison, “No!”. Asked them why, and they said they were afraid of the birds!! Haha! Seriously or not seriously bento?! Both boxes had almost the same contents i.e. I made us both a cheese, luncheon ham, lettuce bagel sandwich. Hubs bagel is poppy seed and mine is cinnamon. We both had small mandarin slices and cherries. He had extra cherry tomatoes and I had some corn rice crackers. Mine bagel seems to look like a sheep but not so quite a sheep. I don’t really know but I added some picks at the mouth area to look as if its munching on some grass and flowers. Haha! Bought Makito Itoh’s Just Bento Cookbook (www.justbento.com) two days ago and love every pages of it. Actually thought that the book will be a lot thicker but it was kind of thin. Nevertheless, every page in the book was written with so much detail and I strongly recommend that anyone who wants to start making bento to purchase this. One other key reason why this book is great for beginners like me is that I love it when Maki said that the most important thing about bento is to ensure healthy eating that’s also pleasing to the eyes but not to the extend that all bento made has to have cute charaben inside. I’ve always felt a little bit intimidated posting my bentos online because I know there are a lot of better looking bentos out there. With Makiko assurance, and knowing that I’ve put my heart and soul into making every single one of them, I am proud to be posting today’s bento and many more to come even if I won’t get to be as good as other bento maestros out there! Thanks Maki! 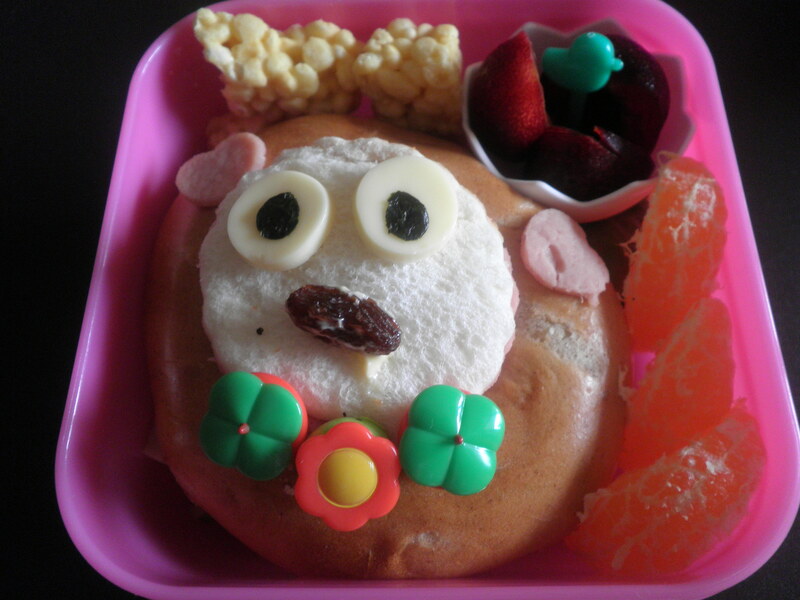 The theme for this morning was inspired by the many other bento mummies out there whom are complaining that summer has ended. 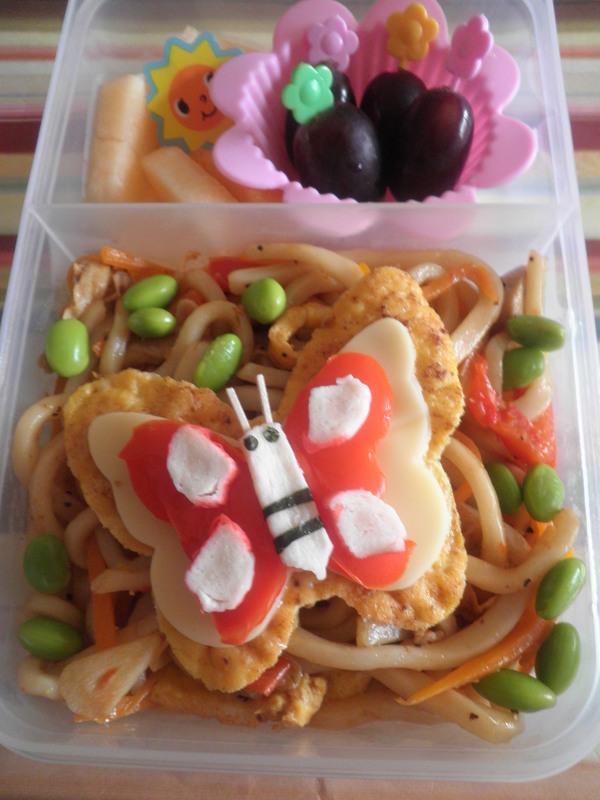 Over here in M’sia there’s always sunshine and hence I hope that making this bento will put a smile back on their faces. The main dish is the black pepper udon that I made with ingredients leftover from the steamboat dinner over the weekend. There were the mini meatballs, minced meat, red bell pepper, julienned carrots, “foo chook” (beancurd skin with some fish paste) and to add a little more colour, edamame! I forgot to put in salt but tasted it and..mmm it sure taste delicious even without the salt. I guess it’s the work of the premium soy sauce my MIL gave me. Haha!